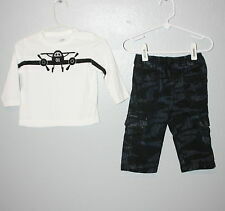 ADORABLE JOE FRESH SZ 6-12 MTHS 2 PIECE BOYS OUTFIT, DARK BLUE JEANS WITH BLACK CAMO PRINT STRETCHY WAIST WITH WHITE CREW SHIRT BLACK AIR PLANE DESIGN, IN GOOD GENTLY WORN CONDITION. NIBWT =N EWI NB AGW ITHT AG. THIS NEWBORN GIFT SET ITEM NUMBER IS:BL1147. THE PANTS HAVE THE BENTLEY LOGO LOCATED ON THE CENTER OF THE WAIST BAND AND SLOGAN "ALREADY A BENTLEY BOY" ON THE RIGHT SIDE JUST BELOW THE WAIST BAND. Size 12 months. Colors include dark blue, orange and white with cars and truck design. Great gift for Baby Shower. 100% Cotton. Size 3-9 months. 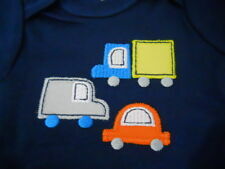 Colors include dark blue, orange and white with cars and truck design. Great gift for Baby Shower. 100% Cotton. A long sleeved top with popper full length fastenings.Pale blue with navy trim and an embroidered digger design. A gorgeous bandana style bib with embroidered digger. A hat with matching digger and trucks pattern. 18-24 months BOY 2 CHECKED SHIRT*TROUSERS BUNDLE *GREY *next day post!! Pair of grey trousers with adjustable waist. Short sleeve, blue/green/white/yellow checked shirt with chest pocket. Short sleeve, white shirt with cranes printed all over. Great set in good condition, however you may find tiny imperfections as it’s used set.